Dotted notes - to dot or not to dot - that is the question. 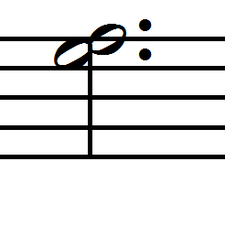 Dotted notes used when writing an interval of a harmonic second do not not always follow the same rules as the placement of the dot after a note. How do we figure out where to place the dot? Where is the correct placement of the dot on dotted notes? To create Dotted Notes, we always write the dot in the space above the line for a line note – right? Wrong. Yes, once again there is a special instance when we do not follow the Dot Placement Rule and that is when writing a Harmonic Second using dotted notes. Dotted Notes are introduced in the Ultimate Music Theory Basic Rudiments Workbook and are required knowledge for the Basic Rudiments Theory Examination. 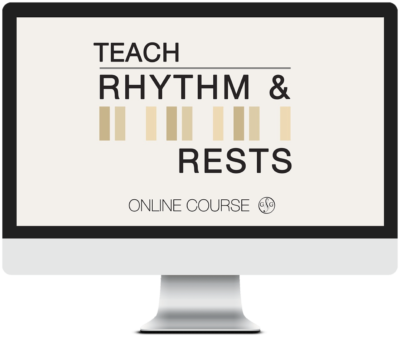 In the Basic Rudiments Workbook on Page 17, we learn the Dot Placement Rule – the dot is written behind (after) the note in the same space for a space note and in the space above for a line note. UMT Tip: A dot placed after a note adds half the value of the note. The Harmonic Second Dot Placement is unique. When writing a Harmonic Second using Dotted Notes, each note must have a dot. In the space beside the note for the lower space note. In the space above the note for the upper line note. In the space below the note for the lower line note. In the space beside the note for the upper space note. We cannot write both dots in the space above the notes. Why? Because two dots in the same space creates a Double Dotted Note – the first dot adds half the value of the note and the second dot adds half the value of the first dot. Double Dotted Notes are introduced in the Ultimate Music Theory Intermediate Rudiments Workbook and are required knowledge for the Intermediate Rudiments Theory Examination. So, as much as we want to have our students stand up, place their right hand on their heart and swear to always place their dots in the space above the note for a line note, we can’t. *Sigh*. Have you ever had that special student who has looked at you and said “But Teacher, you told me that a dot after dotted notes always goes in the space above the note for a line note and now you are telling me that it doesn’t? Were you lying to me?” Yes, that happened to me. Do you ever feel like you have to add the caveat when introducing a theory concept and state “this is the rule for now, but we may learn of an exception to the rule as you get more advanced”? And Yes, I do add that caveat! If there is a theory concept that seems to have an “exception to the rule” and you want to understand how to explain to your students why there is an exception and when we use that exception, don't be shy! I can guarantee you that someone else (probably me) has asked the same question. P.S. Please share your question in the comments below. As you know, I love putting on my Sherlock Holmes Hat!